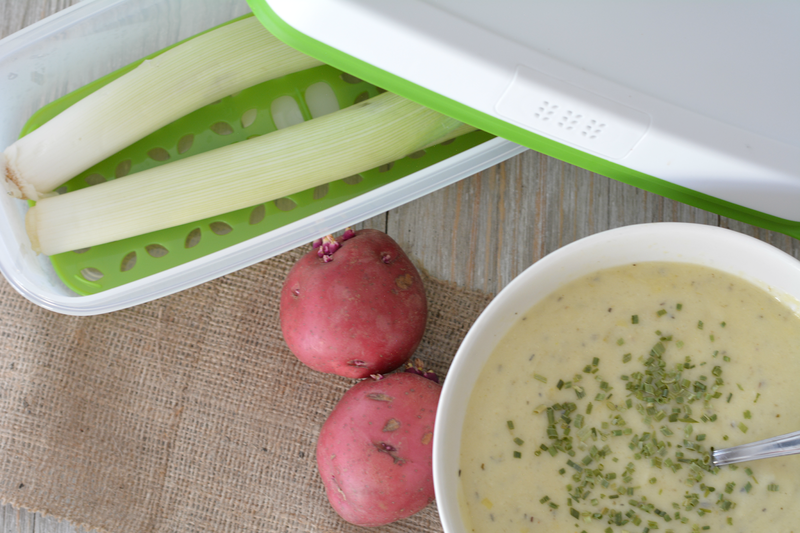 This post and potato leek soup recipe is sponsored by SheSpeaks/Rubbermaid® who has completely rocked my vegetable loving heart with FreshWorks Produce Saver storage containers. 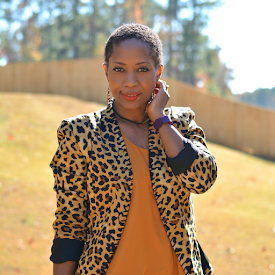 As you may already know, I'm not a fall / winter kind of girl. I love the heat of summer and moving about without coats and thick socks. We have to find the positive in life. For me, I take comfort in hearty soups that warm the body and fill the house with delicious smells. Fall is when I break out the slow cooker and make a big ol' pot of something that gets tastier with each reheat. One of my favorites is potato leek soup. Leeks are my favorite and I can eat them boiled, roasted or pan fried. 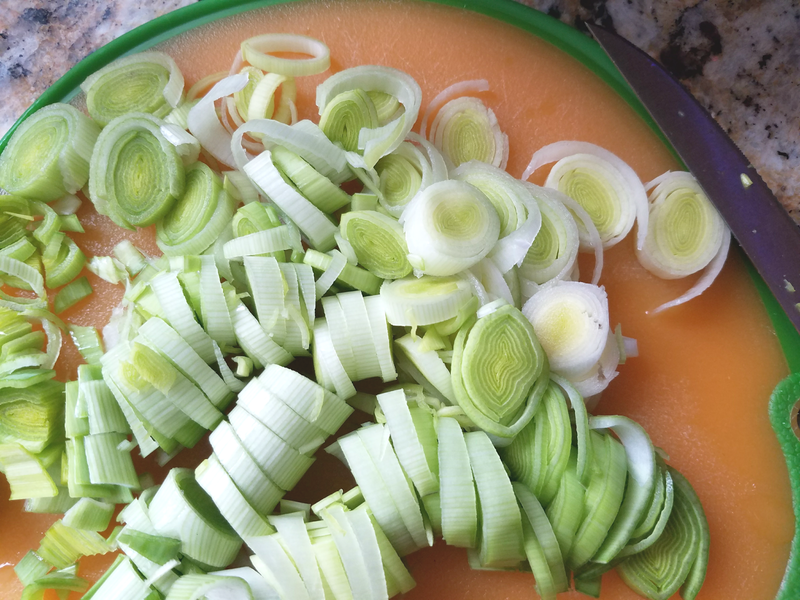 My family gives me the funny eyes when I do this though so a hearty soup with leeks that can't be seen is my best option for keeping everyone happy. Instructions: Chop the leeks up. Peel and cut potatoes into small cubes. Dump everything in the slow cooker except for heavy cream and havarti cheese. Cook on low at least 4 hours. Pour contents of slow cooker in blender along with cream. Blend until fully mixed and completely liquid. Pour back into the slow cooker. Add cheese and continue to cook on low for 30 minutes. Top with chives / bacon. Serve with sourdough bread. I save these slow cooker meals for the end of the week so we can enjoy it over the entire weekend. I do my grocery shopping on Mondays and the majority of my list is fruits and vegetables. Some of my veggies don't make it until the end of the week without spoiling though. I hate when that happens. I hate wasting money and it's super annoying having to trek back to the grocery store. FreshWorks containers are a godsend. They keep produce fresher for a longer period of time. FreshWorks uses patented FreshVent™ technology to keep produce fresher up to 80% longer than the original produce packaging*. The lid filter lasts a lifetime without needing to be replaced. The FreshVent™ lid naturally regulates the flow of oxygen and CO2 so produce stays almost as fresh as the day it was picked. The CrispTray™ at the bottom elevates produce away from moisture and promotes proper airflow to help reduce spoilage. 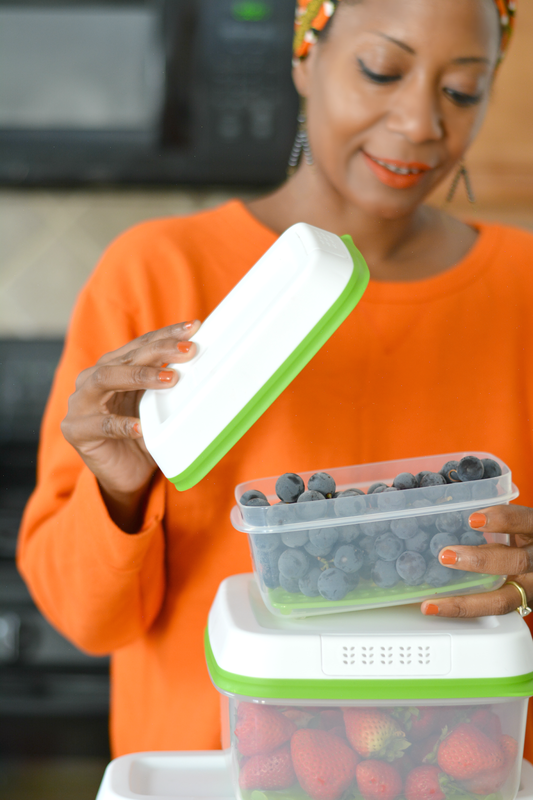 They're available in six sizes to fit all kinds of produce from blueberries to leafy greens. 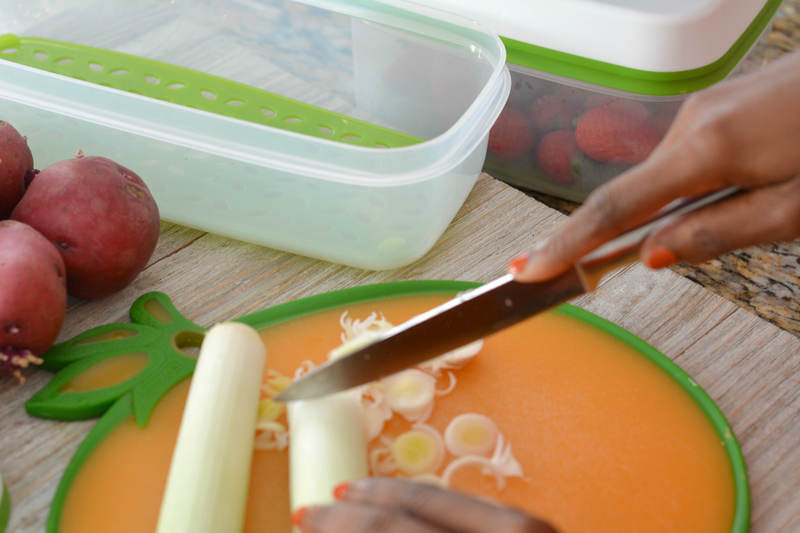 The BPA-free containers are dishwasher safe which is another major perk of these containers. More reasons to love them! Rubbermaid sent me the newest size containers -- a large square that's perfect for tomatoes, a long rectangle that's great for asparagus or zucchini, and the small rectangle that's a good size for green beans. 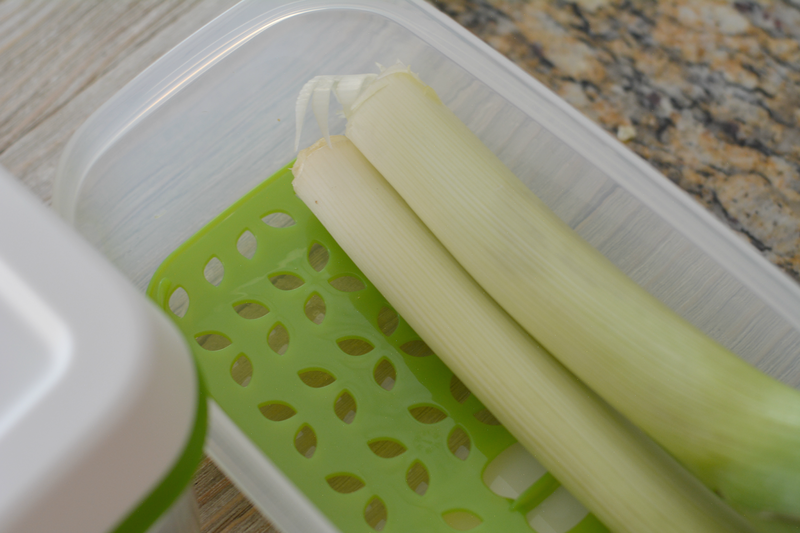 I used the long rectangle for my leeks and I was glad to find them still fresh and crisp when it was time to make the soup. How you keep your produce fresh? 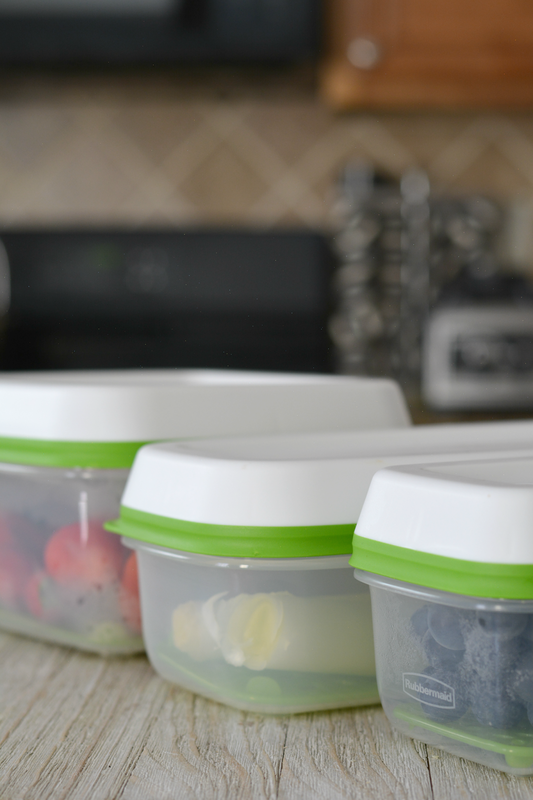 Have you tried Rubbermaid FreshWorks Containers?